TANMS' research plan follows a top-down strategy where testbed systems-level goals guide three engineering technology research thrusts motivating two fundamental research thrusts. The research program relies on system level metrics defined by 3 testbed demonstration modules, i.e. a) memory, b) antenna, and c) motor. 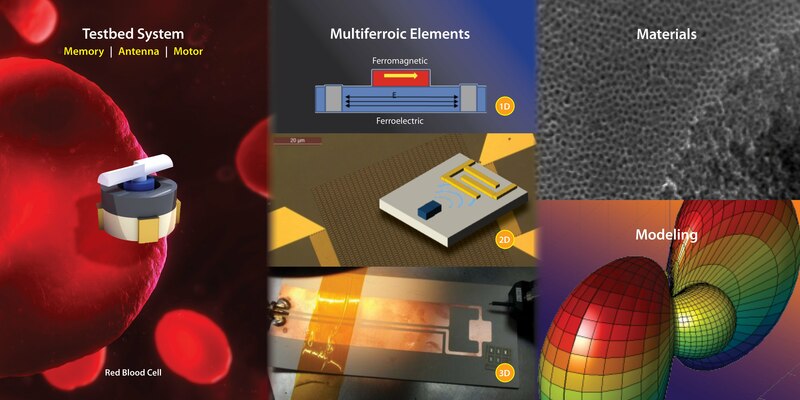 These three testbeds rely on similar multiferroic concepts while also representing electromagnetic devices that maximize this program's impact on our society. The primary goal is to demonstrate an order of magnitude increase in the memories operational Efficiency, an order of magnitude reduction in antenna Size, and an order of magnitude increase in nanoscale motor Power output (ESP). Read more about each of our testbeds here. The three engineering technology research thrusts demonstrate fundamental concepts required in each of the testbed systems. These three technology thrusts synergistically interact with one another to investigate different levels of complexity ranging from 1D to 3D and are applicable to each of the testbed structures. Read more about thrusts 1-3 here. The two fundamental research thrusts focus on materials development and theoretical modeling efforts. The goal is to find new multiferroic materials while supporting the efforts of the engineering technology thrusts. Read more about thrusts 4-5 here.